Russia may reconsider its restricted weapons supplies to Syria in light of the EU’s decision to lift a ban on arms sales to the Syrian opposition. “Every decision has two sides. If one side lifts restrictions, the other may consider itself free from observing earlier commitments,” Russia’s defence minister Sergei Shoigu said. Russia has been heavily criticised after announcing its commitment to the business contracts signed in 2010 that envisage weapons supplies to the Syrian government. 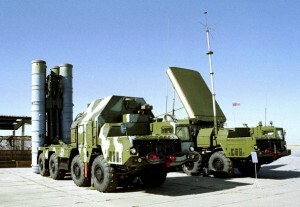 Israel has been particularly concerned about Russia’s deliveries of six S-300 air defence systems to Syria. Earlier in May, Russian President Vladimir Putin and Israeli prime minister Benjamin Netanyahu discussed the Syrian crisis in Russia’s Black Sea resort of Sochi, amid growing concerns over Russian arms supplies to Damascus. Russia’s foreign minister Sergei Lavrov has repeatedly explained to his international counterparts that it is not planning on further supplies of weapons to Syria, but still has commitments under existing contracts. “Russia is not planning to sell,” Lavrov said. “Russia has sold and signed contracts a long time ago, and is completing supplies of the equipment – which is anti-aircraft systems, according to the already signed contracts,” Lavrov added. Before the start of the rebellion against Bashar al-Assad’s regime in March 2011, Syria, the largest importer of Russian arms in the Middle East, had shown interest in purchasing various armoured vehicles, Yak-130 combat trainer aircraft and Iskander-E tactical ballistic missiles. Moscow has denounced the EU move to arm Syrian rebels as illegitimate and violating international law. Russia is worried that resuming arms supplies to the Syrian rebels will hamper the upcoming international conference on Syria, brokered by Russia and the US. “This is a reflection of double standards and a direct blow to the international conference on Syria proposed by Russian foreign minister Sergei Lavrov and US secretary of state John Kerry on May 7,” Russian deputy foreign minister Sergei Ryabkov said. In the meantime Washington has applauded the EU decision. “Support for the opposition is a track that we are pursuing,” White House spokesman Jay Carney said. The European Union has lifted the arms embargo on the Syrian opposition, but extended the sanctions against the Syrian government after June 1. The US and Russia agreed to set up an international conference on Syria during John Kerry’s visit to Moscow. The conference is expected to be held in mid-June and will be a follow-up to last year’s Geneva talks that drafted a peace roadmap for Syria. Moscow wants to involve all the nations that took part in the Geneva conference. Along with Russia, China has vetoed different UN Security Council resolutions on Syria pressuring Syrian President Bashar al-Assad.